The Pentland Hills Regional Park is located just south of Edinburgh. Regional Parks are statutory designations in Scotland providing for the coordinated management of large areas of attractive countryside which lie close to Scotland’s larger towns and cities. The proximity of Regional Parks to large urban areas means that they tend to be under significant recreational pressure, hence the need for coordinated management to ensure the sustainability of the landscapes, habitats and land based businesses supported by the Park. The project explored, with the Park’s Consultative Forum of local stakeholders, opportunities to work with nature and sustain the provision of key ecosystem services - the benefits people get from nature - in the Park. The various report outputs from this project (included on this page) will play a key role informing the next Pentland Hills Regional Park Management Plan (2017-2027). Participatory mapping of ecosystem services currently provided by the Park: we split participants into three groups, based on their interests, looking at the three categories of ecosystem services (provisioning, regulating, cultural). Several rounds of deliberative questioning were then undertaken to elicit locations and broader sites where services are provided. 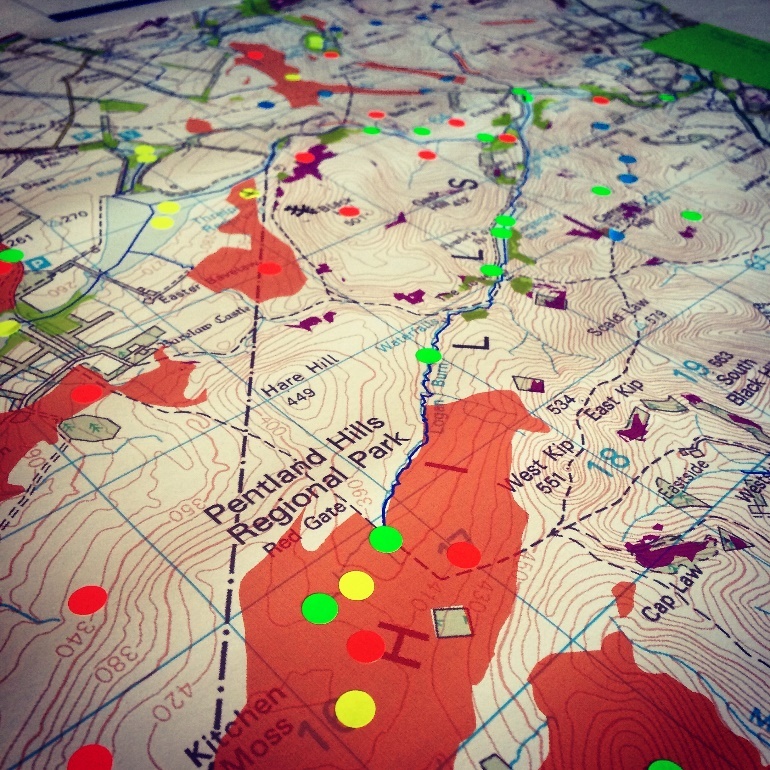 Locations (points) were shown using colour coded sticky dots (see image opposite). Broader sites (polygons) were illustrated by drawing directly onto the map. Assessing the importance of identified services: we asked participants questions about: (i) which landscape characteristics / aspects are important underpinning the provision of the services; (ii) who the beneficiaries are and what the implications of this might be; and (iii) how the benefits are used. This rich qualitative data allowed us to form a view on why the mapped services are important / valued by Forum members. Identifying historic land use management changes in the Park: we facilitated a plenary discussion to explore with Forum members the various land use management changes that have taken place in the Park and whether these are likely to continue. We analysed the various workshop data to make recommendations for future land use and management in the Park (11 recommendations were identified). SNH also commissioned CEP to undertake a short follow-on project in 2017 to validate the hotspot areas identified in the 2016 work and to develop and pilot an approach to site management planning for two example hotspot areas (one upland and one lowland site).